With the leaves falling, I have seen several baldfaced hornet nests hanging from trees. In doing some research I found that although called a hornet, it is actually a type of yellowjacket. The insect is mostly black with white markings including a white head and is about 3/4 of an inch long. we saw this nest hanging from a tree branch. It's on the right side of photo about 1/3 down from the top. 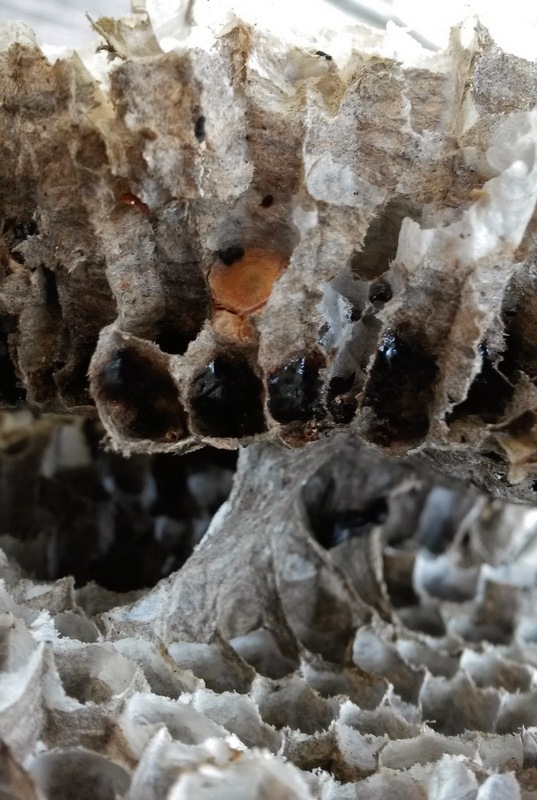 The nests are covered with a gray papery material and can be larger than a football. 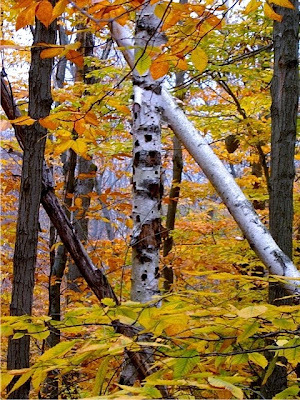 They hang from tree and bush branches or from the eaves of buildings. 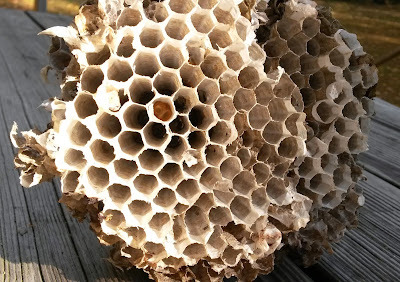 Inside are layers of hexagonal comb like that of bees. 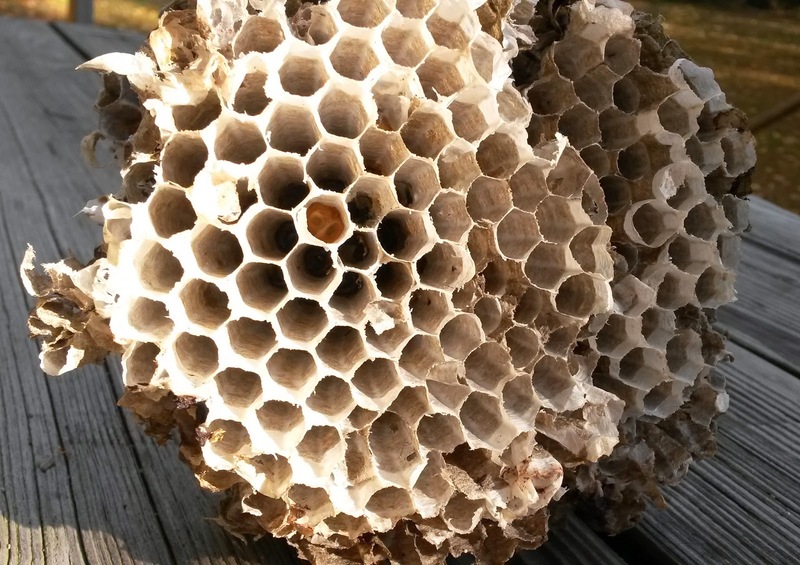 The queen and female workers construct a new nest every year. The paper covering is made from vegetable fibers chewed by the workers and mixed with their saliva to make a pulp which is formed into the paper. Each good-sized nest averages about 400 workers. In the fall, the workers die and the nests are abandoned. The queen lives to start a new colony in the spring. The nests are buffeted by the wind and usually come apart like this one below, that I found on the lawn where I work. The paper covering was gone so you can see the inside. The comb was in three layers. until they become adults with wings. A closeup of the comb. 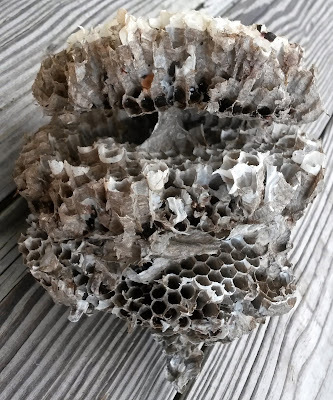 Baldfaced hornets are vigorous defenders of their nests and will sting people when it is disturbed. The sting is similar to a wasp's and reaction varies according to the individual. On the positive side, they kill many pests including flies, spiders and caterpillars. Most nests that I have seen are high enough not to be a problem.